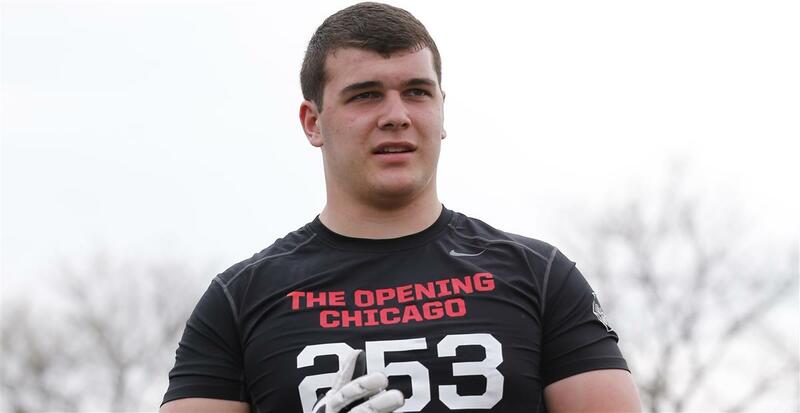 The Michigan coaching staff is continuing its dominance on the recruiting trail as earlier today 2016 Offensive Tackle Ben Bredeson (Hartland,WI) gave his verbal pledge to the Wolverines. Bredeson becomes the ninth recruit that Michigan has been able to gain a commitment from since the start of June. Ben has good size standing at 6’5 and has room to add on additional weight to his frame. He gets off the line of scrimmage quickly and gets into his stance with ease. Possesses a very strong upper body, which he uses effectively to gain leverage on defenders. Plays very physical and will play till the whistle is blown. Does a good job of using his hands to push back defenders and rarely gets beat to the outside. Very polished when blocking the run. Does a good job of identifying his man off the snap and locking into him. Can break off the line of scrimmage with relative ease and set blocks outside the hash marks. Does an excellent job of keeping his feet moving while engaged with a defender. Moves very fast for someone his size and plays with athleticism you don’t always see from offensive lineman. Delivers a solid first punch and can show the ability to drive lineman backwards. Above average footwork and does a good job of keeping his body square. All in all, Michigan has landed themselves a very talented recruit who should become a multi-year starter along the offensive line. With Bredeson’s commitment, Michigan has secured itself a quality offensive line recruiting class with three high profiled recruits already committed. However, Bredeson may not be the last commitment on the offensive line as Michigan is in good standing with multiple recruits such as; Devery Hamilton, Jean Delance, Cole Van Lanen, Terrance Davis, and Alex Akingbulu. Once National Signing Day rolls around, Michigan should have one of the highest ranked offensive line hauls in the country. Ben becomes Michigan’s fifteenth commitment in the 2016 recruiting cycle joining; QB Brandon Peters, OT Erik Swenson, OG/DT Michael Onwenu, RB Matt Falcon, ATH Chris Evans, LB Dele Harding, LB/FB David Reece, QB/ATH Victor Viramontes, ATH Kiante Enis, CB Antwaine Richardson, RB Kingston Davis, LB Dytarious Johnson, TE Sean McKeon, and DE Rashad Weaver.